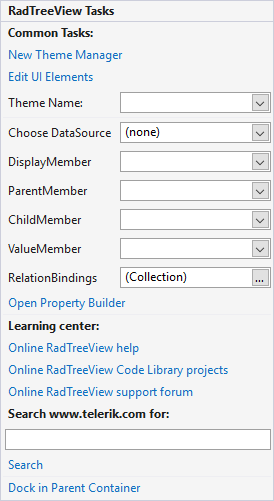 The Smart Tag for RadTreeView lets you quickly access common tasks involved with building RadTreeView elements and customizing appearance through themes. Edit UI elements: Opens a dialog that displays the Element Hierarchy Editor. This editor lets you browse all the elements in the control, including the RadGridView itself and elements that make up the columns, rows, headers and other parts of the grid. Choose DataSource: Allows you to select a DataSource in order to populate the control. DisplayMemeber: Sets the display member. ParentMember: Sets the parent member. ChildMember: Sets the child member. ValueMember: Sets the value member. Relation Bindings: Allow you to edit the relations collection. OpenProperty Builder: Use the Property Builder to quickly create and arrange node structure and appearance. Dock in parent container: Docks RadTreeView into the parent container.